A break in the skin may may present in various forms depending on the nature of the injury. Although it is commonly just referred to as a cut, there are several important terms to describe these wounds – abrasion, contusion, laceration or avulsion. For most of us, the term ‘cuts‘ describes a break where the skin is retained while an ‘open wound‘ is used to refer to an injury where the skin has become torn away thereby exposing the underlying tissue. Although this is rather simplistic, it does help to differentiate between the different types of injuries. Cuts and open wounds occur for a number of reasons and often arise from everyday tasks. In most cases it is only a minor cut caused by a slip of the hand when using a knife or razor blade, a paper cut or making contact with a sharp object. The human body is geared to repair minor cuts within days often leaving little trace that there was any break in the skin. Major cuts and open wounds usually need medical attention but once again the skin is repaired, sometimes leaving nothing more than a little scar or discoloration. However, in the elderly greater care and attention is required for even minor cuts. As the body’s ability to heal declines with age coupled with changes in the skin structure and functioning of the immune system, serious medical situations may arise following a cut or open wound and even become life threatening. It is often not the injury itself that poses the greatest threat but the complications that follow thereafter. Why is wound healing delayed in the elderly? Skin becomes thinner with age and loses some of the moisture and connective tissue support that makes it strong. This means that a cut can may often be deeper than would be the case in a younger person. More importantly though is that the body’s repair mechanism is not as efficient with advancing age. In addition, for the body to repair an injured area it needs the involvement of the immune system which partly facilitates wound healing but also wards of any germs that can complicate the healing process and lead to further tissue damage. The immune system in an older person is not as resilient to aid with wound healing and prevent infection. This may be partly an age-related change but is further complicated by poor circulation, malnutrition and diseases such as diabetes mellitus which is prevalent in the elderly. The risk associated with leaving a cut or open wound unattended is significant in all age groups. The human body is very efficient in dealing with minor cuts but even so, it is not infallible. If a wound, even a small cut, becomes infected, the germs can multiply rapidly and spread under the skin surface. This is infection is known as cellulitis and although it is common, it is a very serious type of infection caused by bacteria that can be life threatening. The bacteria that most often cause cellulitis normally reside on the skin surface. Therefore it is difficult to eradicate these germs entirely. In minor cases the body may be able to fight off these germs until the skin heals and closes the break in the skin. However, with deeper cuts and open wounds, particularly in a person with a weaker immune system, the body has great difficulty in doing so. Although infections are the main danger with untreated cuts, a deeper cut can also lead to bleeding that may be persistent. It is more likely to arise in the elderly with clotting diseases or on drugs that prevent clotting like warfarin or aspirin. Even moderate blood loss can cause a change in blood pressure and other effects that can be dangerous. Always assess a cut and determine whether medical treatment is necessary. A minor cut where there is no skin missing and bleeding stops within minutes after applying pressure can be managed within the home environment. Wash the area thoroughly with an antiseptic soap and apply a suitable solvent to sterilize the wound. Small adhesive patches and bandages may help to seal the area until a firm blood clot can form. Change the patches or bandages on a regular basis and disinfect the area regularly. Avoid water, soap or skin creams from making contact with the wound. New generation silver patches can speed up wound healing. It is also useful to prevent water from seeping into the wound. However, these patches and bandages greatly increase the chance of an infection. It should only be used for short periods and changed regularly. As far as possible the skin should be left to heal while being exposed to the open air. Apart from disinfectants, an antibacterial ointment should be applied regularly to prevent an infection. Deeper cuts, open wounds and burns need professional medical attention. The treatment may vary depending on the nature of the injury as well as the cause. 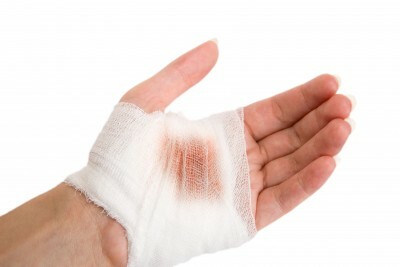 Medical stitches may be necessary to facilitate wound healing. Antibiotics are sometimes prescribed as a preventative measure if there is a risk of infection or a minor infection has already started. Antibacterial ointments are necessary for the wound and surrounding skin. The dressing for these types of wounds need to be changed regularly by a doctor or nurse and the affected area is inspected at regular intervals to spot complications at the outset. These wounds should not be managed in the home environment without first consulting with a doctor.